After receiving an email about the new limited edition nail polishes from Catrice, I had to share it with you, because firstly, it made me squeak and secondly, it made me go wide eyed. 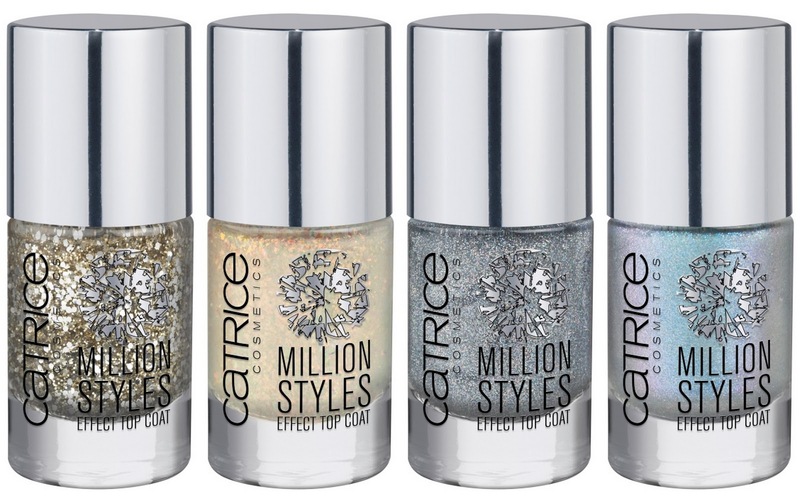 In April, Catrice are rolling out the Million Styles top coats for one and all to play with and admire one's nails with. There will be eight in total, all for a measly €3.29 and I had to show you my favourite ones immediately. L-R: C02 Million Dollar Baby, C04 Shake it! Flake it! C08 Have an Ice Day and C06 Godfather of Pearl. Now beauty junkies, do any of these look familiar? C04 looks like a dupe of the discontinued Gosh Rainbow and hard to find Essie Shine of the Times, where C08 Have an Ice Day looks like a dupe of the also discontinued Gosh Holographic! I'm dying to get my paws on these to do a proper dupe comparison, so roll on April! Catrice is available in chemists nationwide and selected Penneys. Karen where can i buy catrice??? These are fabuloso! Will be stalking Catrice stands. Fact. cannot wait to get my hands on these as well!!!! Gosh holographic is on its way back!!! CAN'T WAIT. Thanks for the heads up. i have two rainbow and one holo from gosh in my stock! Are these available in England? It's a brand I've never come across before? These look AMAZING April is too far away! It was great meeting you at the Vichy event! This made me go OOOOHHHHHH out loud. How sad is that. They shall all be mine.